I harvested more seeds today, the basil and dill. It took me a bit to figure out where the basil seeds were; they’re well hidden in their little seed pockets. Only one mosquito noticed me, and not to the extent of snacking on me, which I appreciated. I snipped some oregano that had grown extra roots and planted it inside. I also saved seeds from a red pepper from dinner and started an avocado seed in some water. “What are you growing now?” Eric said, noticing the latter in a styrofoam cup with three skewers sticking out the sides. “I need more houseplants,” I said. I’m not sure that’s true–or rather, I’m not sure I have space and sunlight for more plants–but he more or less accepted that, after some ribbing about collecting all known plants when he noticed my herb seeds. Once everything comes in, my houseplant population will have tripled from this time last year. I had a Wandering Jew, my cactus, and the mother-of-millions. I’ve added an aloe, ginger, oregano, Meyer lemon, papyrus, and this avocado. Our next house will need more southern-facing walls. The dill and the basil are finally producing seeds. Hallelujah. I was a little worried that I wouldn’t have any, that I would have to (oh horrors, right?) 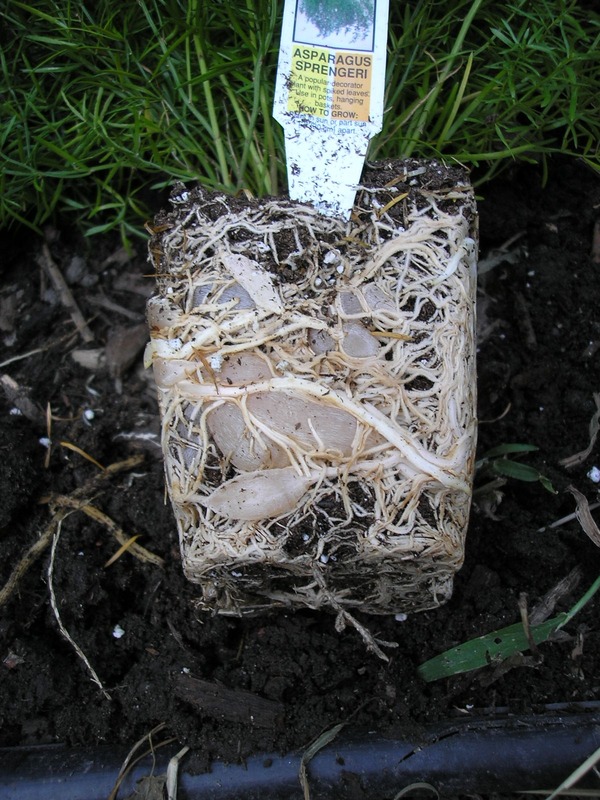 buy seeds for next year. There’s nothing specifically wrong with that, but I’d like to (a) save money and (b) learn about seed saving where I can. So I was glad to see some dry little seeds come out when I rubbed a couple of dried husks while cutting parsley for dinner today. I’ll collect some this weekend and try to remember to succession-sow the dill next year; I’ve found I really like it fresh but it seems to go to seed fairly quickly, like the cilantro. The Taxi tomato is producing a couple of spindly little tomatoes. The other tomatoes seem to have quieted down completely except for the cherry. I’m so glad I only have the one plant. The zucchini is sprawling but not producing. I’m a little disappointed in it. Was I supposed to keep it pruned? Once the cucumbers and cantaloupes were gone I didn’t see any particular reason not to let it grow as it wanted, but I’m not sure either it or I benefited. There’s not much left of the garden, I’m afraid. Toledo’s average first frost is tomorrow but we probably won’t see one for another two weeks at least; but it’s very slow. I’ve put off the cleaning up and mulching over operations until slightly cooler weather (though I noticed a distinct lack of mosquitoes this evening, which is hopeful). But I’m only going out there every few days–except for when I need parsley–and not bringing much back. Except from the Asian pear tree, which is a delight. When the garden folds up for the winter (except for the Swiss chard and the carrots, I believe) I’ll write up my overall impressions, along with my thoughts on the varieties I planted this year. I can already say I’m never planting Toga eggplants again, unless it’s for the decoration. I can also say there’s a lot more I want to do next year–which is a sign that this has been a good gardening year. I hadn’t realized until the other day that once again we got no pears from the pear tree. Not because it didn’t bear fruit, but because every one of them disappeared sometime after I noticed the hard, small fruits. The peach tree is covered in leaves, like an overly hirsute man, but no fruit–which is fine, since it’s its first year. The Asian pear, now, is covered in fruits, and the squirrels (or whatever) don’t seem to care for them, which is delightful since I do very much. Eric has also voiced a newly-discovered liking for them, which is good because he likes regular pears too and it looks like he’s never going to get any. It stormed tonight, which means I don’t have to water the poor potted pepper that was drooping. After this, it’s supposed to be cooler–highs around 70, lows around 50–for at least the next week and a half. I plan to do more yardwork tomorrow, since it should be the right weather for it. And it’s getting to be time to clean things up. There are fruits in the trees, there’s apple cider in my fridge; fall is coming, and I’m glad. This is my garage. Yes, those are nasturtiums growing over that bike. (Can you tell we haven’t been for a bike ride all summer? The fact that my bike was stolen doesn’t help, of course.) The garage borders the garden on one side, you see, and there are holes in the lower part of the wall. And the nasturtiums were a lot bigger than I thought they’d be, and this one had free rein, and…well…it’s not how I would have decorated given a chance, but it’s good to see whenever I pull the car into the garage. My first thought was “Slugs!” followed closely by “They can’t be slugs, what are they?” They appear to be part of the roots…but ferns aren’t nitrogen-fixing, are they? What’s going on here? At first I was afraid to plant it, but then I figured, why not, and now it’s in the ground. No wonder katydids need to disguise themselves; this guy was at least two inches long. I didn’t want to disturb him, so I didn’t transplant the lemon. 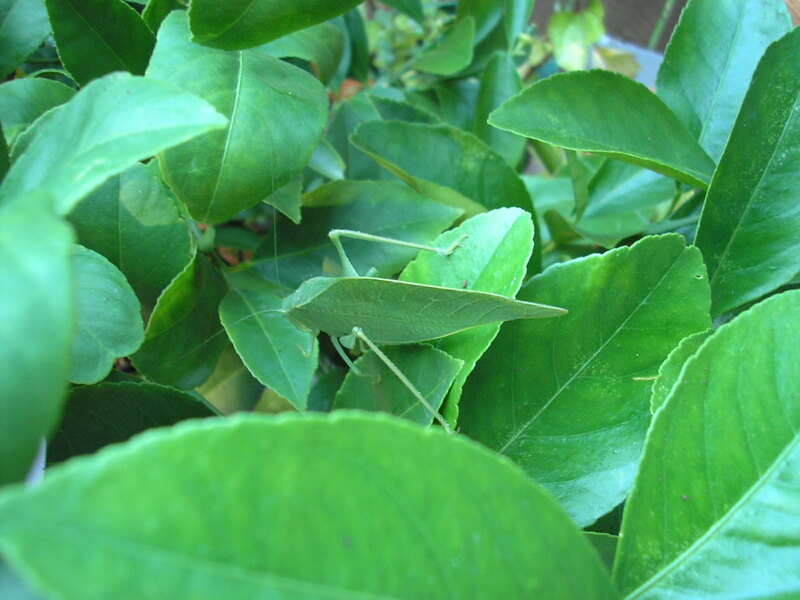 Now that I’ve looked them up, though, I’m a little concerned that this guy was a girl, and I’ll have a katydid nursery on my hands…plus they eat leaves. Maybe I’ll go tell him/her to buzz off. I went to Andersons yesterday for shrubs. With the vegetables cleared out of the driveway bed, the island with the fruit trees, and the side of the garage, I have places for plants and no plants to put there. Well, that’s not true; I could divide some of the plants I have. I have no plants I want to put there. So I went to the garden center and poked around. They still have herbs out, and I considered buying something to put in a pot for the winter, but then I remembered that the plants I have already crowd my one good sunny window and forbore. (Besides, I might be able to get a cutting from my oregano plant, once the spider I saw on it last moves away.) I bought a small pine shrub–I miss evergreens–and a fern and a couple of shade plants, including wintergreen, which I bought two of because, well, it’s wintergreen. It so happens that I have coveted a Meyer Lemon tree ever since I heard about them. I was temporarily interested in the orange, since the leaves are prettier, but the tag said the fruits are sour and only used for preserves, and if I’m to have an orange in the house I want it to be an orange I can eat fresh. So the Meyer lemon came home with me. That plus a bigger pot to keep it in reduced the reasonableness of my purchases. But between those plants and the bulbs I’ve bought (irises and scilla and chionodoxa, which I’ve never heard of but looked pretty on the box) I’d say I now have enough plants to satisfy my urge for fall planting and take a step towards being more than a vegetable gardener. Saturday we were supposed to go to Cedar Point. We didn’t, and instead I went to Costco with my mother-in-law to check it out (I grew up with it, but she didn’t) and then both Eric and I spent a good chunk of time over at my mother-in-law’s playing board games (well, one: EuroRails, which I adore but only play once every several months because it’s a long game and takes a lot out of the players). “It’s supposed to get down to 38 tonight,” Eric reported as we sat in the computer room after showering when we got home. “Anything about frost?” I said offhandedly. At Costco I had bought a $30 jacket, fake shearling. I put it on and went outside. The garden was hopeless, so I brought in the porch plants I wanted to keep through the winter, the bay tree and the papyrus. I had to trim the papyrus before setting it in the plant window; it’s grown quite a bit since the wedding. This morning everything seemed healthy. But frost is coming. I went out to the garden yesterday for carrots and herbs for zucchini soup I intended to make. (I did, and it was fine, but not spectacular–I put too much stuff in, I think.) I noticed a small blooming flower on a mostly-fallen sunflower stalk and was pleased. I pulled up two carrots, picked some basil and sage, pulled up a handful of parsley, and walked back into the house.My hair is long, and it tickles my arms sometimes, and the herbs were also tickly. I kicked off my shoes, went to the counter, noticed my thumb was particularly itchy, and looked down–where I saw a spider’s leg tapping it thoughtfully. The bunch of herbs flew onto the counter and I went the other way, shaking my hands from the wrists–it’s something I do when the arachnophobia hits. The spider, amber-colored and fat-bodied (maybe an orb weaver? ), crawled out slowly from under a basil leaf and looked around. So did I.
I am, obviously, afraid of spiders. I don’t hate them, I acknowledge they do good work, but still I cannot function if one like that is in the same room as me, especially if it has already touched me. There is no way I could transport a spider that big on a piece of paper or similar to get it outside. And Eric was not home. So I did what I had to do: I pulled a bunch of paper towels from the roll, wadded them up, held the wad over the poor confused spider, and–after a moment of phobic wavering–pushed it down. There was a sickening crunch and I yelped. After a moment I gathered up the paper towel that I had fortuitously laid out to receive the herbs beforehand and was now the spider’s shroud and threw it away. I washed my hands and the herbs very, very thoroughly before starting the soup. I planted the very last of my salad mix and spinach seeds today. There were only a few left, and the ones I’d planted before mostly haven’t come up, so I figured, why not? It’s supposed to be in the 70s this week, with lows getting down to the 40s. It’s definitely that turning time of year. I harvested two butternut squashes–they’ve been tan and hard for a while but I left them on the plant, fearful of bringing them in too soon. But then I read that leaving them too long is detrimental, so in they came. There are at least two immature ones, too; we’ll see if they make it. The green pepper has decided the time has come to be prolific. The zucchini has taken over most of the raised bed. It’s hard to believe that’s just one plant. The Taxi tomatoes are apparently making a comeback, despite being determinate–I picked one ripe one today and there are other green ones hanging out. Apparently they’re like my Quinault strawberries, one harvest in the summer and another in the fall. I’m glad I didn’t pull them. I went out well girded against the mosquitoes, and I think I escaped them all. There are so many fruit flies, though. They’re everywhere. The Togas are ripening, and quite pretty. They’re too little meat and too much seed for me to really like them, though. I think I’ll roast a bunch and put them through a sieve to get the seeds out, and make baba ghanouj, and next year I’ll plant a different variety. Tomorrow, unless life intervenes, I’m going to Home Depot to pick up mulch, pots, shrubs, and bulbs–at least the first two, and the last two if I find ones I like. It’s time for fall planting. Which means time for weeding, laying down newspaper, mulching, digging up the plants I don’t like and planting ones I do. Oh, and it means working around the neighbors’ tomatoes. They’ve spilled well over to my side and are invading my garage bed. I’ve picked four tomatoes so far and some of the fuzzy ones are starting to ripen, so I don’t mind. 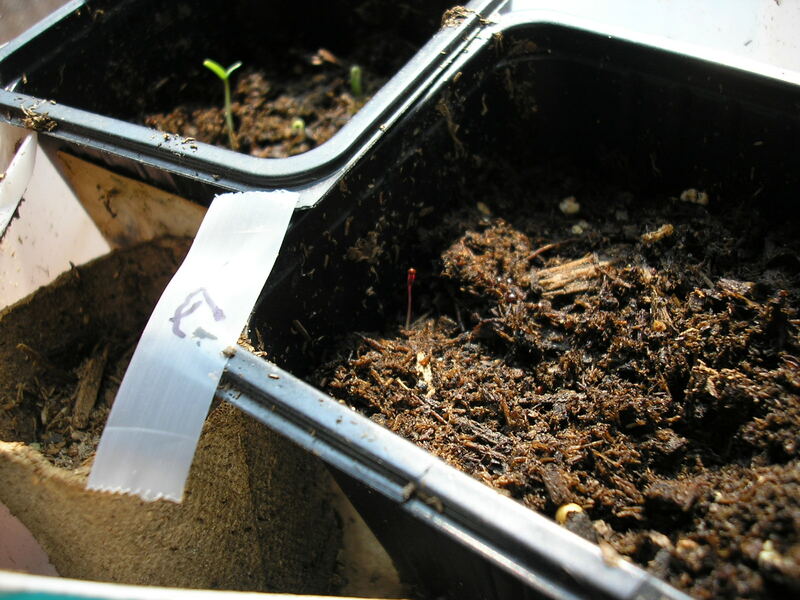 At the risk of sounding like a ghost of my March and April self: I have achieved seedlings! I know, you’re saying to yourself, when did she move to the southern hemisphere? These are amaranth and tomatillo seedlings that I saved and wanted to test because, as usual, I have no faith in Nature to work, at least not when its tool is me. But they grew, so I can tuck those seeds away in the fridge (that works, right?) to await spring.